Domain Eukarya: Can be single celled or multicellular and has a nucleus. Kingdom Animalia: All are multicellular, heterotrophs and ingests food and digest it in an internal cavity. Phylum Chordata: Chordates have a notochord (which is a cartilaginous skeletal rod supporting the body), bilateral symmetry, and a complete digestive system. Subphylum Vertebrata: Has digestive system with large digestive glands, 2 sexes and ventral heart with 2-4 chambers. Class Mammalia: Has differentiated teeth, replaced once in a life-time, 4 chambers to heart and secondary palate separating air and food passages in the mouth. Order Primates: Recognized based on characteristics of skull, limbs and teeth, well-developed tibia and fibula in the hind leg, pentadactyl feet ( having five toes or fingers), include first toe with a nail, others use digits, nails and claws. Family Hominade: Hominades are omnivorous (which means that their food is of both plant or animal origins) , good climbers, well-known for social behavior and makes use of nests and gives birth to single young. Genus Gorilla: This genus only includes the gorilla. Height: The western gorilla usually is 14-17.5 m tall. Weight: The males usually weigh about 136-181 kg and the females usually weigh about 72-98 kg. Color: The western gorilla has short black fur, the top of the head is brown and has no hair on its face. Geographic Range: The western gorilla can be founded in Equatorial Africa, Cameroon, Central African Republic, Equatorial Guinea, Gabon, Nigeria, Republic of Congo, Angola and in the Democratic Republic of Congo. Habitat Description: The best habitat for the gorilla is tropical secondary forests and has an open canopy that allows light to the forest floor. Diet: Gorillas eat leaves, stems, pith, seeds ,insects, herbs, shrubs, vines, fruits & vegetation. Predators: Western gorillas have only two predators, humans and the leopards. 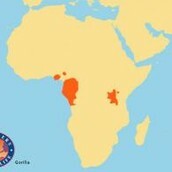 This map shows where the western gorilla lives. When gorillas walk on all fours, it's called "knuckle walking". The western gorilla has short black fur, the top of the head is brown and has no hair on its face. The short black fur is suited for their warm and moist forest habitats. They also have no under fur to keep cool for their habitat. The gorilla's hands and feet are strong and broad. They are strong because most of the time they walk on all fours. They have muscular necks to keep their heads up because they walk on all fours most of the time. When they walk on all fours, it's called "knuckle walking". They have short muzzles because they eat plants and they don't need large mouths to eat meat. The western gorilla has large jaw muscles to intimidate predators and scare them away. Western gorillas are usually peaceful creatures but when they are disturbed they stand on their feet and pound their chest to show off strength to intimidate predators. When gorillas are annoyed or intruded, they growl loudly to intimidate the intruder. If that doesn't work, then they charge at the intruder. They rarely hit the intruder, yet they only want to scare them away. They keep charging at the intruder until they go away. When an intruder comes, males hoot and holler to alarm other members in their family. Silverbacks are the oldest and largest gorilla and leads the family. 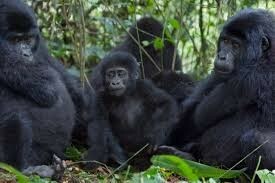 They are called silverbacks because when they get older their black backs start to turn silver. The silverbacks are in charge of the decisions like when to wake up, when to move and when to rest. 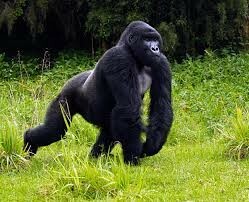 The silverbacks tends to be most aggressive to keep the group safe. Younger males in the family are called blackbacks because they have black backs before they get older. Western gorillas live in a band of 6-12 gorillas for protection. New dominant male kills infants to reproduce cycling. The male increases chance of offspring by doing that. Male's ability to fight increases to make sure his babies survive. Fighting is receptive to females. "Basic Facts about Gorilla." Defenders of Wildlife. N.p., 2015. Web. 13 Mar. Burton, Maurice. "Gorilla." International Wildlife Encyclopedia. 3rd ed. Vol. 8. "Gorilla." Smithsonian National Zoological Park. N.p., n.d. Web. 13 Mar. 2015.